You did a good review. It sounds like it has some potential and could be interesting. I’m not sure where you go with your story however, if you’re not going to be invested in fighting good and evil? Also, I get easily disinterested when there is propaganda, when it becomes preachy and you’re aware you’ve just been lectured about racism or recycling or something. Thanks, insanitybytes22. 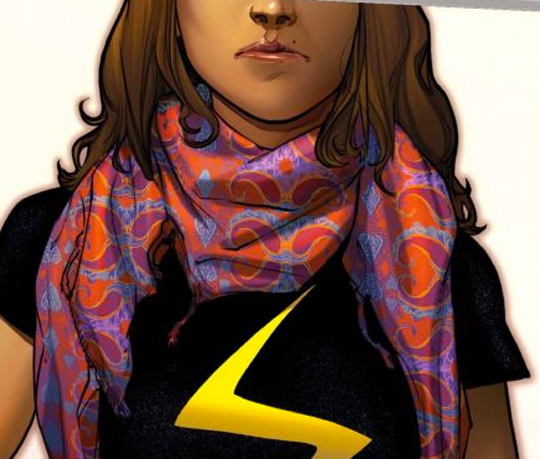 I wanted to review Ms. Marvel for quite some time. I figured since I wrote a blog post after the series was announced that I should try and read it and give it a fair shake. There are certain comic book creators out there who would like their followers to believe I’m incapable of writing an honest review. Wrong. I always strive for honesty in my reviews. The problem some people have had with my reviews is that I’m willing to call out politically correct pap when I see it. Same here. I get turned off when writers decide to lecture me about how bad they think I am for having conservative views. Message fiction in general turns readers off and generally doesn’t sell, whether it’s a comic, novel, TV show or movie (anti-war movies always bomb at the box office). That’s why you have to put storytelling and entertainment first. Solid review, as I have asked in the past could this book be better if they explore the true history of the character more? I think it currently focuses on making us look bad and it neglects telling the complete honest story. With more truth and depth this book could be a good tool for diversity, with a slanted agenda it could end up as trash. Thanks for the honest, refreshing review. I say refreshing and honest because it’s the first review of the book I’ve read that didn’t have the liberal catch phrases “white privilege” and “check your privilege” in it. Sounds like it’s decent but it can’t decide what it wants to be. 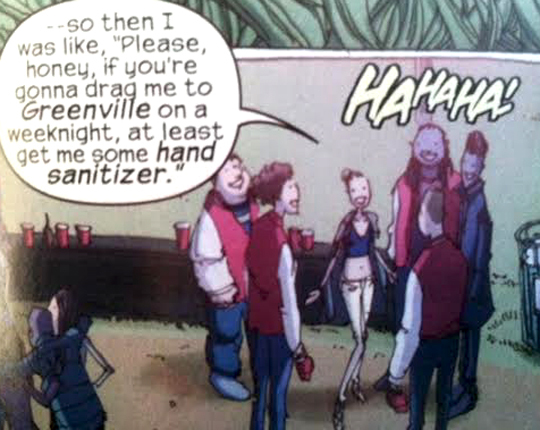 I also have issues with the way the way that girl and her friends are depicted as stereotypical racists. That isn’t going to endear it to people beyond its niche audience. I almost wish that someone would tell me to “check” my “white privilege” to my face one day so I can burst out laughing right in front of them. Yep. I don’t agree with the way that all of the messages are presented, but it is good writing. 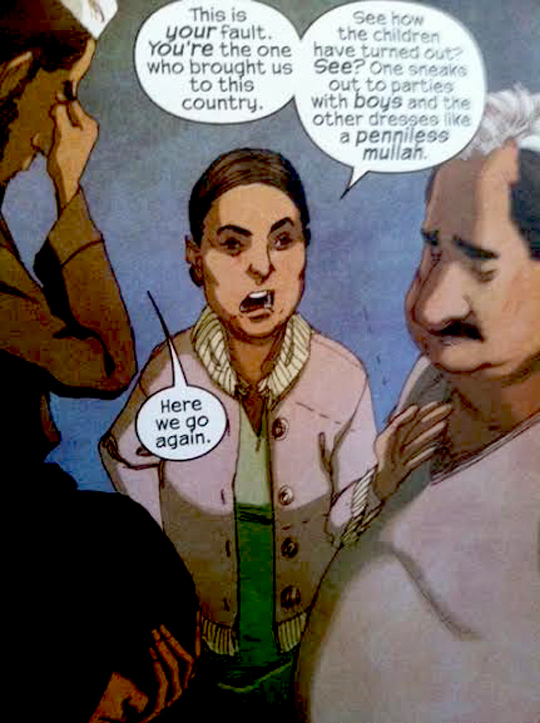 If Marvel had any guts, it really would explore things like Islamic terrorism in the book. It would be fascinating to see Kamala come to grips with that, the effect it would have on her family, etc. A mature writer could balance the need to show that the vast majority of American Muslims are just like Kamala, while also showing that there is a strain of Islam that produces The Boston Marathon bombing, the 9/11 terrorist attacks, the “Jersey Six” terror plot on Fort Dix, Umar Farouk Abdulmutallab’s 2009 Christmas Day attempt to take down a plane over Detroit (i.e., the underwear bomber), and so on and so forth. No one’s ever said that to my face. Usually the people who have told me that have been safely behind a computer where they would be spared seeing me laugh at them. I’ve always laughed at the notion that I’m “privileged.” It’s like the new race card. I think those would be interesting ideas to explore as well. I don’t know if they will, though. Ha, ha! He threw a tantrum and bailed because he couldn’t handle it when you, Hube and everyone else demolished his PC gobbledygook on a regular basis. I remember he was pretty obsessed with diversity and ranted about the “white default” and “white privilege” and other such PC nonsense. Remember, he also threatened to boycott Marvel Studios until they satisfied his feelings. I’m sure they’re weeping… all the way to the bank. You’d think now that they’ve announced a Black Panther film and a Captain Marvel/Carol Danvers film, this would satisfy him, but he’d probably just dismiss them as tokens. It will be interesting to see what the new complaints will be now that Marvel is going to have a female-lead movie along with Black Panther. To me, Black Panther isn’t really that big of a deal because the success of the Blade movies speaks for itself (and those didn’t possess the kind of quality audiences expect from a Marvel Studios film). Very true. A lot of people overlook the Blade trilogy’s success, probably because it’s easier for SJWs to complain about the “white privilege” rather than acknowledge that it was a successful series with a black lead. It helped keep the superhero film genre afloat at a time when “Batman and Robin” left it for dead. I look forward to Black Panther. I’ll probably check out the Captain Marvel movie if it looks good. As long as it’s not another Catwoman or Elektra…. ugh. I’m glad you touched on the confused duality of the comic. 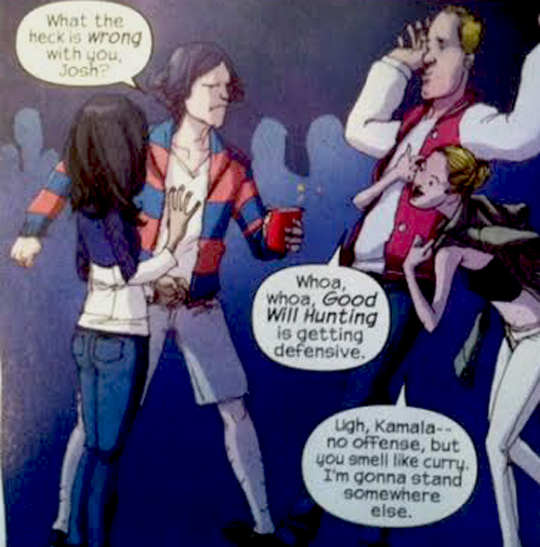 On one hand, the comic approaches things whereas Kamala is portrayed as an ordinary teen (with funny moments such as that “I’m in a Spiderman team-up” part). On the other hand, the comic uses very cliché plot devices such as the racist high school characters (what is this Degrassi?). I think the writers need to decide which hand they should be using. I always hated that show Degrassi. It’s one of the most ridiculously PC shows out there. My sister used to watch it and it really exaggerated high school problems. I was in high school at the time she watched it, but my high school was never as dramatic as it was on that show. Sure, quite a few girls got pregnant at fifteen, there was strife between different cliques from time to time and there was a “gun scare” in my junior year (that turned out to be a MySpace hoax), but it never to the level you’d see on Degrassi. Marvel’s prog fundamentalists are more screechy, uneducated, and arrogant than the worst Protestant fundamentalist you might have ever met. I am surprised a conservative writer like yourself is in support of this. What on Earth do you mean by conservative is the real question. Political conservative (a meaningless term since it has been coopted by neocon chickenhawk profiteers) ? At its most basic “conservative” was defined as a person who wanted to preserve what already existed previously, as having innate value, and who wanted all inevitable change to be no swifter than it absolutely had to be. It’s part of the marxist anti-Western dialectic to constantly redefine words, shift goal posts, undermine normality and normal meanings of concepts. So define what you mean by the absurd label “conservative”. I’m a nativist anti-radical, I’m not conservative. People like me are who you are probably lumping the writer in with, and we are not the same. And even then it implies a simplicity of thought on the part of a writer, and reactionary hidebound conditioned reflex form of thought, that properly belong to the marxist mind-slave and not to a freeborn free thinker of any persuasion. Clever propaganda is the most dangerous propaganda of all. Going into this odious exercise in islamic propaganda, the creators knew the real challenge was to humanize the face of the enemy of civilization. The inhuman angle, the “they’re just like us” angle, the use of a teenage girl character (“what kind of MONSTER would attack this character”) is just so much taqiyya. In a future age when islam and its puppetmasters are crushed, perhaps the time will be right for an islamic fake character like this. Until then, it belongs in the same pile of twaddle as all the other right-on attempts at propaganda. The long march through the institutions has clearly included the institution of American cultural icons such as four-color reading material and this is a serious situation. Mind control by any other name. Let its time be cut short; let its place be taken by another.